Nectarines and peaches are quite similar and have the same cultural needs. Nectarines have smooth skin, Peaches fuzzy skin. Nectarines often have a more subtle flavor. Fantasia - A large, yellow fleshed nectarine. The fruit is highly colored, firm, freestone and of good quality. Ripens mid-July. The tree is a vigorous grower, productive with short chilling requirements. Bears well in mild-winter areas. Very showy flowers. Ripens mid-July to early August. (Mid-season/self fertile). Goldmine - Large fruit, red-blushed over white with white freestone flesh of good flavor. 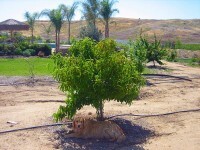 Vigorous and productive tree. The primary home variety. Low chilling requirement. Ripens early August. (Late/self fertile). 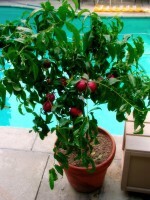 Ultra Dwarf Nectarine Patio Tree (image)​. Independence - Fruit is medium to large. Flesh is yellow, firm, freestone with good texture and flavor. Skin is brilliant cherry-red. Ripens mid-June to early July. Trees are moderately vigorous and productive. Accepts warm winters. Showy flowers. Panamint - Medium to large fruit, bright red, with yellow freestone flesh. Vigorous, productive tree. Low chilling requirement. Ripens from early to mid-July. (Mid-season/self-fertile). Redgold - Widely planted commercially because of its crack resistance, slow softening, high yield and the longest storage and shelf life. Skin is deep red and flesh is very firm and crack resistant. It is a freestone with a rich flavor. Must be properly thinned for best production results. Ripens early August. Snowqueen - One of the very best nectarines ever. An outstanding low chill variety. Very large, light skin lightly blushed with russet. Flesh is white, freestone, juicy and fine textured. Best when picked firm and allowed to ripen indoors. Ripens mid-June. ​​Ultra Dwarf Patio Tree (image). Sunglo - A large, smooth skinned, freestone nectarine. The skin is red with golden flesh. Has a long storage and shelf life and doesn't lose its flavor when canned or frozen. A hardy and vigorous grower.